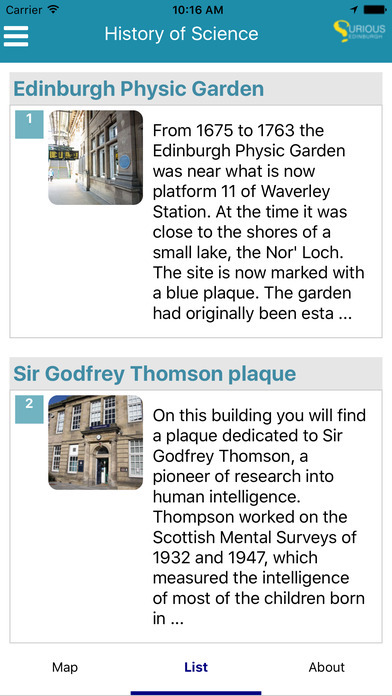 The Curious Edinburgh mobile app will help you explore the rich history of scientific discovery and practice in Edinburgh, and it’s free to download and use! Download a copy to your Android device (running Android 4.1 and up) or your iPhone or iPad (running iOS 8 or later), try it out, and do let us know what you think – rate or review us on the App Store or on Google Play, or get in touch with the team through the comments here, or by email. Download and install the app from the App Store or on the Google Play Store. 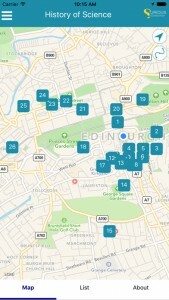 Tap on the Curious Edinburgh app icon to open up the app and start exploring! 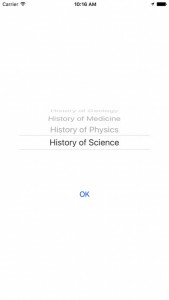 Select your tour – scroll through the options and then select and tap “OK” to begin exploring the History of Science, Geology, Physics or Medicine in Edinburgh. Explore the Map of your tour, which takes you around some of the most notable moments in Edinburgh’s scientific heritage as well as some of the most beautiful parts of the city. You can follow the tour in any order but we’ve suggested a route that you’ll find on the map (tap on the S shaped button on the top right to view a suggested route). Click on numbered tour stops to view more information, tap on images and videos to view in more detail. Alternatively: explore the List view to see all of the tour stops at once. Tap on a tour stop for more information, images and video. Enjoy exploring the app and the city! We would love to hear your comments on the app, the tour, and your suggestions for improvements in the future. To find out more about the Curious Edinburgh project, the team behind the app, and our wonderful partners, supporters and funders, take a look at our acknowledgements page.